Nicely printed in gold letters and a 3D gold crucifix attached my dear son First Communion card. 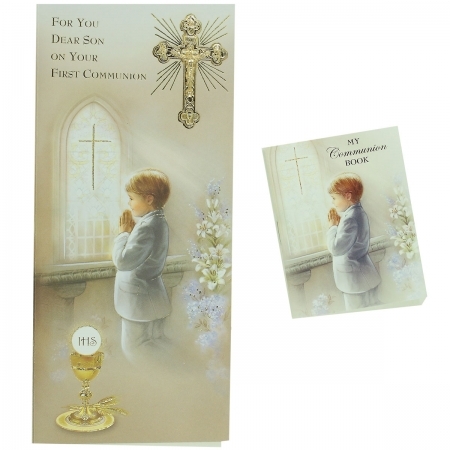 Inside the card reads "A Special Prayer is sent your way on this your First Communion Day. May God's live guide you and bless your life with ever happiness." A 64 pages Communion Book with the Order of Mass is included with this card. The book is colour illustrated with favourite Prayers. Supplied in a protective transparent case.